Vermont is the second smallest state in the country, and has the least amount of violent crimes! The state’s largest employers include IBM and Ben & Jerry’s. If you are looking to live somewhere pleasant, Vermont would not be a bad choice as it consistently ranks in the top states for happiness, health, and intelligence. Let’s take a look at some of Vermont’s safest cities. Of the 25 safest cities in Vermont, 20 of them received a Safety Score of at least 80! 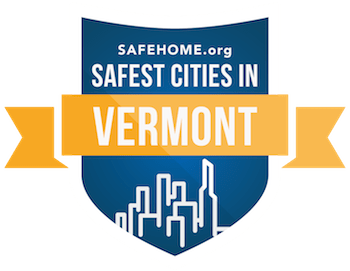 Super safe cities of Vermont include Randolph (95.31), Hartford (96), Northfield (94.15), and Swanton (92.61). The State’s Capitol, Montpelier received a safety score of 83.15. It’s a slightly bigger town than Castleton with a population of almost 8,000 in 2010. Vermont’s largest city, Burlington scored 73.11 in safety according to our list, which is pretty good considering the population is a lot larger (just over 42,000 in 2014), with all different types of people living here and passing through.